Monster Max: DREAM. 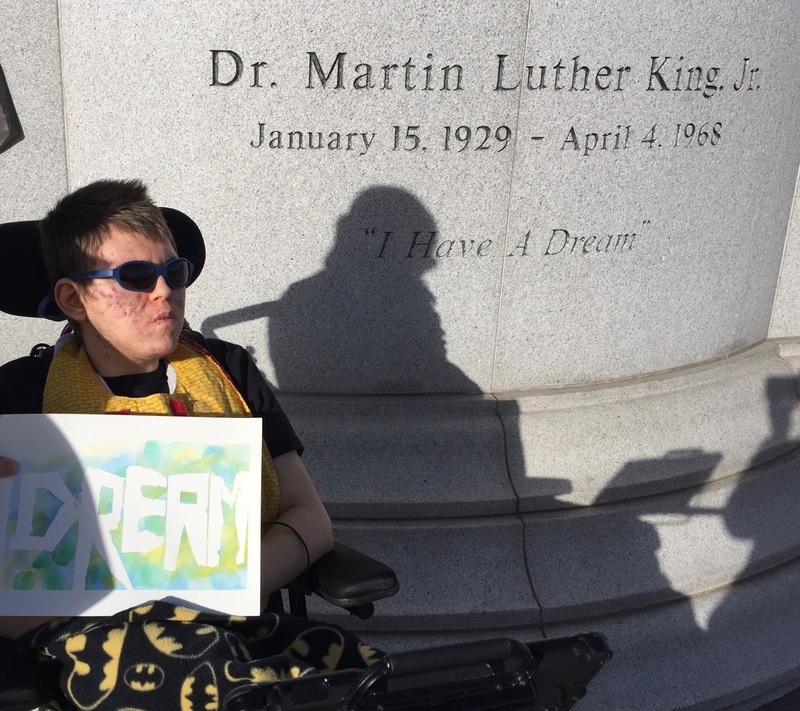 . .
As is his tradition, Max went to the Martin Luther King, Jr. Memorial in Denver yesterday. There is a big parade every MLK Day, but he likes to have the space to himself. Max wanted his pal, B to come along this year so she could see just how awesome it is to him. I think he had the best time with the best January weather. It's been so wonderful to see him smile more this week since starting the steroid treatment for the acne fulminans. He has been so happy to be outside for the first time in months! Brittany and Max walked around and read all the quotes and timelines on the monument. Max told her he the ones he liked. Daddy reads this one to Max every year. It's some of MLK's most recognized quotes. Max waited his turn to get close to the memorial. It was busy yesterday because the weather was so nice. It's always so interesting to see the people from all walks of life who stop to pay respects. Max made this painting and wanted to take it with him to the memorial. It was his word for the day. DREAM. The man with a dream with the Max with a dream. Max and B on one of their adventures together. Dedicated to every person past, present, and future who has committed his or her life to the struggle for freedom, justice, and peace for all. After he views the memorial, he likes to go to the informational area with recordings by Denver's mayor about all the memorial represents. Each year I'm so moved at how much this moves him. He's found purpose in his life to care for the people on the sidelines, like himself and he inspires me every day to do more. Whatever career you may choose for yourself—doctor, lawyer, teacher—let me propose an avocation to be pursued along with it. Become a dedicated fighter for civil rights. Make it a central part of your life. It will make you a better doctor, a better lawyer, a better teacher. It will enrich your spirit as nothing else possibly can. It will give you that rare sense of nobility that can only spring from love and selflessly helping your fellow man . Make a career of humanity. Commit yourself to the noble struggle for human rights. You will make a greater person of yourself, a greater nation of your country, and a finer world to live in. I'm so glad to hear that Max is getting out and is feeling happier and better. May it continue!